We have been launching many new webdesigns and redesigns lately. 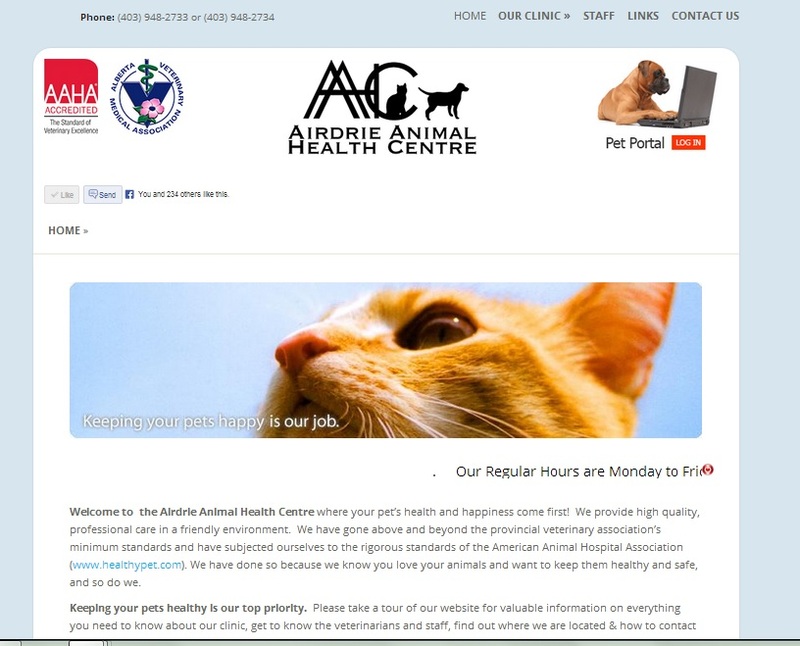 Here is one we are really proud of: Airdrie Animal Health Centre. They are are great veternarian clinic, professional and friendly, and very high standards, and now have an equally great website to match. If you are looking for a vet for your pet and live in Airdrie I highly recommend them. Even if you live in Calgary, they’d be worth the short drive. We wanted to capture their love and health knowledge of animals and their welcoming attitude toward the animal’s owners. You’ll see a clean and friendly design with a marquee and slider of animal photos. The marquee gives the user reminders about holidays and clinic hours and the slider portrays their fondness and appreciation of pets. The health information uses a specialized drop-down tab to make the health information easily navigable. We also designed a virtual tour (which is waiting new photos). If you’d like a new web design by Ducktoes Calgary Web Design just give us a call at 403-219-3031. We’d love to make you an eye-catching website for your organization, business, or professional practice.